Create a better scope of work by asking the right questions. You've most likely had this frustrating interaction: A prospect calls and says, "I need a new website. How much will that cost me? Oh, and I need it done by the end of next month." Many agencies, rather than lose the project, rush to write up an estimate. This approach often leads to unprofitable projects as the scope of the redesign expands. Even worse is the fact that the redesigned website -- once launched -- doesn't help the client meet their marketing goals. Before you start making wireframes and setting milestones, properly scope the project and get a better understanding of the client's business and goals. To help you get started, we created this website redesign questionnaire. 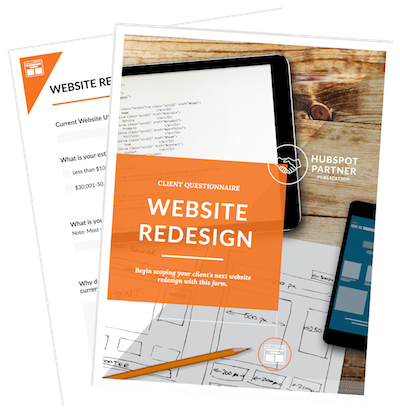 Use it to determine how the client's website should function and what KPIs to track to measure the ROI of the redesign. Get this helpful website redesign questionnaire to use on your next project right now.